Animism is the belief that non-human entities are spiritual beings, either intrinsically or because spirits inhabit them. Pantheism is the belief that everything shares the same spiritual essence—individuals do not have distinct spirits or souls. Animism puts more emphasis on the uniqueness of each individual soul. In animist societies, ritual is considered essential to win the favor of the spirits that ward off other malevolent spirits and provide food, shelter, and fertility. Shamans, also sometimes called medicine men or women, serve as mediums between the physical world and the world of spirits. animism: A belief that spirits inhabit some or all classes of natural objects or phenomena. shaman: A member of certain tribal societies who acts as a religious medium between the concrete and spirit worlds. spirits: The undying essence of a human. The soul. Animism refers to the belief that non-human entities are spiritual beings, either intrinsically or because spirits inhabit them for a period of time. Unlike supernatural forces, animist spirits may be inherently good or evil. Often, these spirits are thought to be the souls of deceased relatives, and they are not worshiped as deities. While animists believe everything to be spiritual in nature, they do not necessarily see the spiritual nature of everything in existence as being united (monism), the way pantheists do. Animism puts more emphasis on the uniqueness of each individual soul. In pantheism, everything shares the same spiritual essence—there are no distinct spirits and/or souls. Because humans are considered a part of nature, rather than superior to, or separate from it, animists see themselves on roughly equal footing with other animals, plants, and natural forces, and subsequently have a moral imperative to treat these agents with respect. In animist societies, ritual is considered essential to win the favor of the spirits that ward off other malevolent spirits and provide food, shelter, and fertility. Shamans, also sometimes called medicine men or women, serve as mediums between the physical world and the world of spirits. Animism is thought to be the belief system that laid the groundwork for the notion of a soul and the animation of traditionally inanimate objects, allowing every world religion to take those basic principles in other directions. Though earlier philosophers such as Aristotle and Thomas Aquinas discussed animism, the formal definition was postulated by Sir Edward Taylor late in the 19th century. Examples of Animism can be seen in forms of Shinto, Hinduism, Buddhism, pantheism, Paganism, and Neopaganism. 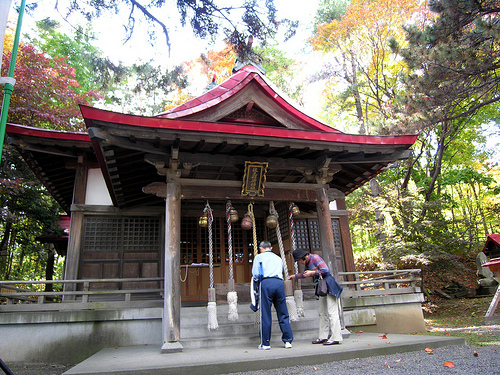 Shinto Shrine: Shinto is an animistic religion in Japan.